Definition at line 33 of file cfpython_party.h. Definition at line 35 of file cfpython_party.h. 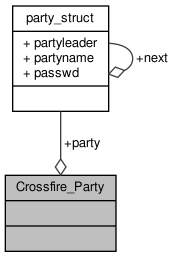 Referenced by Crossfire_Party_GetName(), Crossfire_Party_GetNext(), Crossfire_Party_GetPassword(), Crossfire_Party_GetPlayers(), Crossfire_Party_InternalCompare(), Crossfire_Party_wrap(), and Player_SetParty().